I have been living with a PD diagnosis for 9 years, have been on levodopa medication for 8.1/2 of them and over the years have adopted various ways of maintaining/ improving balance. First off, I started by just carefully standing on one foot and then the other, sometimes trying some arm movements while doing and/ or trying to raise the legs in different postures – this wasn’t always very successful but usually ended up with me in giggles. At the time of diagnosis I shared my home with my Shiba Inu dog and he was always happy with me, however daft I might appear! 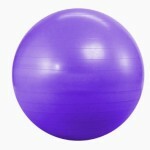 Then I found out about Swiss Balance Balls – they are the very large inflatable balls you find in all gyms these days. I bought one for my height/weight and found that there are a lot of exercises available for these online and physios can advise you one what is best for you. It is easy to find what works for you – most of the time, though, I would just try one-foot-off-the-ground balancing, some rolling from side-to-side, or I would sit on it to watch TV. Finally, just before Christmas 2014, I discovered gym quality mini- trampolines when I was Googling for “balance exercises”. From watching several YouTube videos – “gentle health bouncing” to energetic pre-ski workouts – I decided to make a mini-trampoline my Christmas present to myself. I loved the idea that they are used by NASA to help astronauts regain bone density without jarring the leg joints (at the bottom of the bounce your weight increases due to the effects of gravity) and of course there are cardio benefits too. 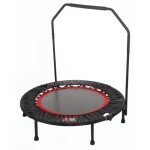 The mini-trampoline I have is the Urban Rebounder – it is permanently in place on my sitting-room floor. It is probably about 4ft in diameter, it has a detachable grip rail but I just position it beside a sturdy dining-chair these days. I started just by standing and gently bouncing – the idea is to bounce down rather than jump up – and although I can’t properly run/march due to leg hesitation, I can bounce and lift my heels as if walking on the spot. You don’t have to do a mega session unless you want to or are able to – in fact I tend to hop on it while waiting for a kettle to boil, i.e., just for a few minutes at a time, several times most days.. I feel my balance is improving, my posture is straighter…and, I absolutely love the child-like sense of glee I get when I am on it. Wherever you live, first have your GP/family physician confirm that there is no other medical reason to stop you using a rebounder and then get bouncing and find out for yourself just how much fun it is. I would also urge you to get your GP/family physician to refer you to rehab. physio – it is really worth getting physio advice on specific Parkinson issues and what help your situation needs. Health bouncing has an immensely beneficial effect on one’s lymphatic system. All I knew about the lympatic system was that it is the body’s waste-disposal system (you can Google for more info) but what I didn’t know is that, unlike the blood circulatory system, it doesn’t work if you don’t move!!! As I have been mostly on my bed for a few years now due to gastro issues unconnected with my parkinsonism, I was horrified to realise that my lymph system was probably stagnating as a consequence! So… gentle on-the-spot walking /bouncing (or even strenuous if you can manage it) on a rebounder will re-energise your lymphatic system. I am about to go into hospital this afternoon for cataract surgery, just like hundreds of other people across the world today. I also have parkinsonism, gastro problems and a demonstrated inability to metabolise sedation/anaesthesia properly. It is the combination of all these factors that is making me nervous today. The eye surgeon and his secretary have had good info regarding my sedation and gastro problems and have, I am told, passed this on to the duty anaesthetist. Everyone on the medical side has also said “oh yes” when parkinsonism is mentioned – even the nurse at the pre-assessment. On the one hand I should, I suppose feel optimistic and reassured by that “oh yes” – it means,at least, that people have heard of the condition. However, it does cause me a little concern as most people associate parkinson’s solely with tremor or motor symptoms and they don’t realise the huge raft of non-motor symptoms that beset the majority of us with the condition. I don’t know what to expect, really. Wearing off in parkinson’s and not getting medication on time can have a really horrible outcome. The worst scenario is a situation called “neuroleptic malignant syndrome” (NMS) – google it – its blooming terrifying. Once a person (in hospital or at home) has missed their meds, they are potentially on a downward slide that is not always reversible. This webpage explains it well. It really is a scary situation and across the UK there are reports of patients with parkinson’s not getting medication on time, even when they have family members to speak up for them. At home one is in control of one’s medication. In hospital one is entirely dependent upon the nursing staff to observe the need for patients on parkinson’s medication to #getitontime. This rarely happens. 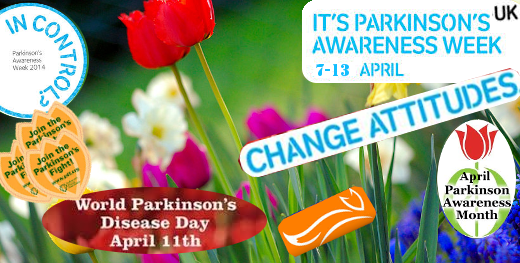 Parkinson’s UK continues to campaign for this to change. Am I thinking I will end up with NMS? No, of course not.. not really. I am still that irritating glass half-full person who always sees an upside to everything … but deep down… part of me is wondering how the medication side of things will play out. My gastro problems are pretty serious and will be affected by my being sedated later today. Due to a range of factors, perhaps including parkinson’s gut dysmotility, I experience recurrent pseudo obstruction. That also sounds a bit lightweight.. “pseudo” eh? Well it’s not. The use of the word “pseudo” in this context simply means there isn’t some horrible lump or torsion obstructing the way, instead my system blocks just anyway. Damage to my spine has affected the sacral nerve, I have abdominal adhesions, blah blah blah… you don’t really need or want to hear all the details. Suffice to say that being sedated/anaesthetised is just what my obstructive system doesn’t need…it stops it… so getting it working again might be a bit of an issue. My inability to metabolise sedation/anaesthesia is unusual to say the least… I just don’t remember how to move when I wake up. I feel as if I am encased in foam and people seem very far away (it seems as if I am looking down a narrow tunnel to them) and I have no connection with my limbs. In recent years, since the parkinsonism was triggered in March 2006, I have, unfortunately, had to have general anaesthetic/sedation on a couple of occasions but each time a little more has been learned about managing the situation. Most important, it seems, is to not let me lie flat for too long (I daren’t even sleep on my back these days as I’ve woken from naps at home with “foam” creeping up my arms and legs!). I need to be propped up to avoid pharyngeal reflux anyway, so … if I am on my side and propped up, then I seem to do better. Still a lot sleepier than the average and walking is wobblier afterwards, but those who know me, know that a slow and lurching gait is how I roll these days!! The intense muscle pains as my limbs regain life are appalling… but welcome in a peculiar way as it means my nerves are beginning to reassert themselves! Maybe this time it will all be easier than ever before – let’s hope so. Oh and the cataract surgery? Delicate, precise and wonderful is the reputation of the guy replacing my right lens later today. Afterwards my -6.25 eye will be -3.0 – I’ll be a bit visually-challenged for a couple of weeks as my left eye will remain at the -6 stage until its lens gets replaced, so it may be “interesting” to see how I cope. But that aspect of what is about to occur is, I hope, the least of my concerns! Quite why I am writing this now I am not sure. Perhaps because I am more nervous than it is mature to admit… but… wish me luck and I’ll see you (geddit) in a while. I was right to have been nervous. The info provided prior to both the 7 July right-eye surgery and the 21 July left-eye surgery was ignored/dismissed by nursing and medical staff alike. The complete lack of awareness of Parkinson’s (“there are so many different diseases these days” was one comment), lack of interest in the impact of specific actions/inactions on my neuro and gastro symptoms and the lack of genuine care (with a couple of exceptions) was as I had feared. The good news, however, is that despite my focus taking a while to settle, I no longer see a world tinged with yellow – the new clarity of colour is lovely! CONCLUSION: (1) back to the drawing board for getting hospitals/staff to manage my needs (2) beware taking Stalevo – as well as turning fluids yellow it can cause cataracts and turn your lenses yellow! Day 5 of 7 of Awareness Week 2014 and after an appointment with my GP (family doctor) this afternoon, my thoughts turned to how to be #incontrol of the relationship with medical and health professionals. During the appointment, my GP made reference to my “exotic form of parkinsonism” and while I understand his choice of words (my symptoms arrived fairly well developed and out of the blue in 2006) I suppose the “exotic” label could be applied to pretty much everyone with a parkinsons diagnosis. The disease has been called a “designer” disease, or one that is “tailor made” for the individual, because there are many many motor and non-motor symptoms under the umbrella label of Parkinson’s Disease but each individual experiences some of them, rarely all of them, in varying degrees. In aviation, when one pilot is handing responsibility for the aircraft over to a colleague, the phrase often used is “you have control” and the pilot taking over replies “I have control”. Medical and health professionals have a wide range of diagnostic tools, therapies and drugs at their disposal to help each of us with parkinsonism. Once a diagnosis has been reached, we need to decide how we are going to interact with these professionals going forward. For me it is simple. “I have control”, I want to be #incontrol of my parkinson future. I choose to take full responsibility for fighting the battle against the insidious and encroaching symptoms of the disease and I will seek expert review on an appropriately regular basis. In addition to reading widely about the condition (anecdotal articles in magazines to scientific papers somewhat beyond my comprehension!) I joined Parkinson’s UK, I support Cure Parkinson’s Trust, and I identified which medical and health professionals should form my home team, to help me keep #incontrol of my disease. In the beginning, compared with now, my symptoms weren’t nearly as intrusive, but nevertheless I divided them up according to which medical and health professionals would be best at helping me manage them. I didn’t really know much about this therapy (I probably still don’t, if I am honest) but assumed that it was mostly to do with the spoken word. Wrong! Speech and Language Therapy is essential for those of us with parkinson’s who experience problems with swallowing as well as problems with speaking (volume and tone as well as word-forming) and understanding the spoken word. Over the years in addition to attending an annual review session, I have been included in a parkinson’s group therapy based on LSVT LOUD. I have a note of exercises to be done to maintain vocal chords and to help keep my tongue muscles properly mobilised. I experience auditory dysfunction which prevents me following conversation when more than one person is speaking, so I have been given strategies to help me manage this. When I find others asking me to repeat what I just said, or replying with an answer to something I didn’t just ask, I know I need to work harder at my SaLT exercises – they really do make a world of difference. Protein can impact the efficacy of parkinson’s medications, so it is important not only to take meds at least 30mins before food but also to reduce the intake of protein overall. As gut motility can be affected by parkinson’s, a healthy and well-balanced diet is essential, as is drinking plenty of water every day and, obviously, to use common sense when partying or drinking alcohol. I have a complex of non-parkinson issues that affect my gut and I regularly see a gastroenterologist for these so as the parkinson’s problems have begun to encroach, although it has taken a long time to get tests scheduled, I am beginning to regain some semblance of being #incontrol…for now! It is also possible to be referred to a dietician if you find it difficult to find ways to modify diet (residue and fibre) to keep the system working effectively. There are many kinds of neurologists but the “type” people with parkinsonism should ideally see are movement disorder specialists preferably with a special interest in Parkinson’s Disease/parkinsonism. There are no cures (yet) for PD, so the best any neurologist can do for us once a diagnosis has been arrived at, is to identify the moment at which medication should be introduced. Many parkinson’s symptoms are similar to those of other diseases and the pace at which symptoms progress can indicate something other than classic idiopathic parkinson’s, so neurologists have the unenviable task, sometimes, of having to adjust a diagnosis. There is no single test that can confirm parkinson’s ab initio and for most people, the diagnosis is established when symptoms respond well to medication. There are many medications now in use to help us, and many of them have unpleasant quasi-toxic side effects. It is therefore vital to take the medications prescribed, exactly as prescribed, and to report accurately on the effects felt. Only then can a neurologist, or Parkinson’s nurse practitioner (who you may see instead of a neurologist), truly help you find the drug regime that suits you best. Deep brain stimulation and new research is opening up the world of possible treatments available for some who may be eligible to benefit from them so… make the most of those precious moments with your neurologist. They are pure gold and can really help you stay #incontrol! I haven’t yet needed the advice or help of occupational therapy, but as I wish to remain as independent as possible, I know that these will be the experts I must seek out when I am no longer #incontrol of even routine activities. Parkinson’s UK has an excellent explanatory leaflet here. Most of us may only have worked with physiotherapists if we’ve suffered a sports injury, or needed help with mobilisation after surgery. The idea, then, of seeing a physiotherapist before there is a major problem is a little alien, but it is really important to learn how best to exercise and move to keep parkinson’s problems at bay and stay #incontrol of mobility. Walking, turning, trying to swing arms, not bumping into things, avoiding tripping, maintaining balance can all be helped by physiotherapy. Since 2006 I have requested physio once and was referred to a rehab physio department where I had 8 one-to-one sessions and came away with a list of exercises which I have continued to do, pretty faithfully, up to now. I think at some point during this year I may find out if I can be re-referred as my symptoms are so very different now. Last in my list but by no means least are our beloved GPs (family doctors). The majority are very busy individuals who see a huge number of patients with a wide range of problems every day. Some may have an interest in movement disorders and even parkinson’s disease, but even if they don’t, they are our first port of call for all our medical needs. We can’t expect them to be experts, but we can expect them to support the recommendations of our neurologists, listen to our medical concerns, prescribe the medications we need and refer us, as appropriate, for therapy sessions. it is important to have a good GP to help us identify which new or different symptoms may be part and parcel of our parkinsonism and which may be unconnected. On Day 4 of the 2014 Parkinson’s Awareness Week in the UK I just want to share with you why I believe the world remains my oyster! Feeling #incontrol gives one a sense of dignity and self-worth and for those of us still living independently with Parkinson’s, finding ways to maintain that sense of self-worth, in spite of the erosions of disease, is important. I have always worked in organisations that were global in mission, in both the public and private sectors, and most of my working life brought me into contact with people around the world. So for me to be happy I need to feel engaged with the wider world. These days my life is mostly housebound and for anyone looking at the drastic and radical change in my circumstances, and comparing how I lived BP (Before Parkinson’s) with AP (After Parkinson’s), might easily lead people to be shocked or saddened for me. I can’t pretend that I am not sometimes shocked and saddened for me too – it is all so very different. The reality, however, thanks to my access to the internet, is that no-one needs to feel this way for me for too long. I appreciate sympathy and support and welcome offers of help, of course I do, and there is no doubt that I’d really rather not have any chronic, progressive and incurable disease …BUT I have chosen to accept what has to be accepted and find a way of living that allows me to battle my symptoms, have fun, remain engaged in things that are important to me and allow me to remain (mostly) #incontrol. The world remains my oyster and it is all thanks to my access to the internet. With the internet, not only am I sail-racing (virtually) with Sailonline and also helping run the site as one of the volunteer admins, I am Tweeting with astronauts and watching rocket launches, keeping up with chums around the world via Facebook and email, watching TV online, learning how to create graphics with GIMP and sharing them online (see this blog, Jubilant’s blog and my website), finding recipients for knitting projects (hello Battersea Dogs and Cats Home! ), keeping up to date with developments in Parkinson’s research, engaging with wildlife and environmental campaigns that matter to me (protecting tigers, protecting the world’s oceans), keeping an eye on weather situations around the world… my world is still full of endless possibilities and I am kept busy! Without the internet I believe my life would feel much diminished. It would undoubtedly be preferable to be actively and physically engaged out in the world, but the raft of gastro and parkinson’s symptoms that hold me hostage makes that very difficult and oftentimes impossible, so the internet permits me to get involved/remain engaged as much as possible, while enabling me to create a calm and appropriate environment at home which helps to keep my symptoms under control. I feel very lucky and wish that one day everyone with Parkinson’s/parkinsonism may feel as #incontrol as I do right this moment! 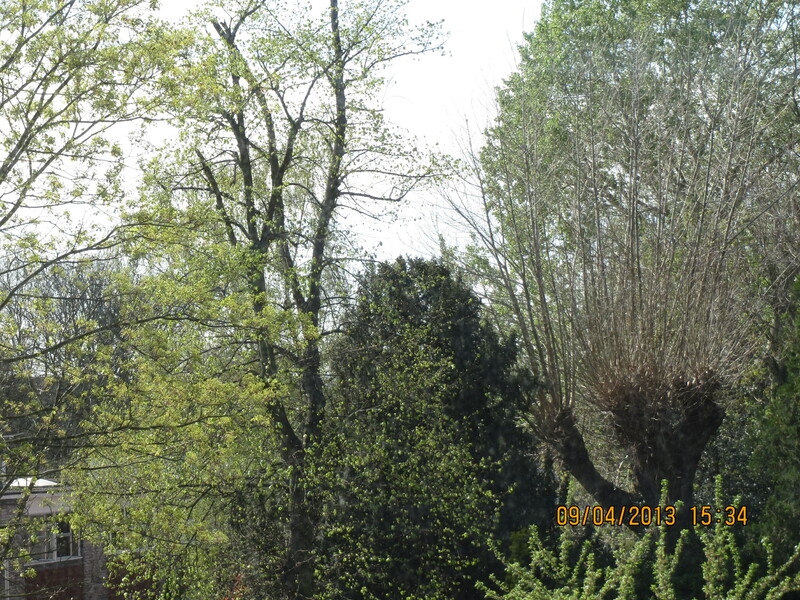 The sun is out, the sky is blue, there is a light breeze and it looks just perfect for a walk outside. BP (Before Parkinson’s) life was busy and active and while my dog was alive, we’d be off and out for a walk two/three times a day in a matter of moments. 1. Adjust my intake of food/liquids for some hours before leaving to make sure that “tanks are empty” if I am to be away from home and my bathroom for an hour or more as I have to manage a complex of gastro/bladder issues due in part to parkinson’s. No, you don’t need to know the details (suffice to say pain and other problems often keep me indoors)! 2. Make sure medication effects are optimal. Parkinson’s meds operate on a Bell curve – slow to take effect, building up to optimal and then wearing off. Wearing off doesn’t just have an effect on mobility but also on one’s ability to process speech, visual cues and can make one appear horribly incompetent and outdoors that makes me feel very vulnerable. 3. Put on thick soled boots/shoes to reduce the vibration from pavements and to prevent my feet from dropping. Vibration just makes my legs hurt more and solidifies muscles so anything to reduce this means I can stay out longer. If I want to wear normal shoes, then I have to reduce my walking to a minimum and really concentrate on not tripping. My walking socks are my own handiwork and super-comfy. 4. Plan what clothes to wear – autonomic dysfunction means my temperature can fluctuate wildly – wearing the right layers can help. 5. Allow plenty of time to get ready – all aspects of clothes and shoes require focus! 6. Plan precisely where I am going and how I am getting there – try to think of all that might go wrong and by doing so reduce unexpected stressors. 1. Try to walk upright – problems with proprioception mean I no longer know where my feet are, I rely on instinct and keen observation of the ground ahead, this can mean I end up walking head-down and leaning forward if I don’t concentrate on not doing so. Walking feels like wading through deep water, so I tire quickly. When I am tired, I lean more on my cane, so I have to try and avoid that too. 2. Try to walk evenly – I use the lines between paving stones as markers and aim to make good strides to avoid “parkinson shuffle”. I hum or count to myself to keep the pace going. The slightest distraction can divert me from this, so don’t ask me to walk and talk. My cane acts as a trigger to keep me walking although loss of concentration and tiredness can mean that I don’t always move it adequately. 3. Allow plenty of time to cross the road. Automated crossings are a nightmare as their timers always click off too soon for me. Zebra crossings are brilliant and drivers mostly very courteous. Where there is no crossing, I feel very vulnerable (unless there is an island, dividing two lanes). Vehicles have to be a long way away before I feel safe to attempt a crossing. 4. Look, look again, look a third time in each direction before crossing a road – a quick glance can mean I miss a potential hazard. The outside world is so full of objects – moving and stationary – noise, colours and bustle, that it is very easy to be distracted. As I can overbalance if I turn too quickly, I mustn’t be hasty when checking traffic. 5. Walk in harmony with others on the pavement – I never want to be one of those who think they have the right of way because they have walking difficulties. 6. Try not to be so bound up in my world that I miss opportunities for appropriate interaction with others, e.g., a sympathetic smile to a mum struggling with a fractious toddler, a wave across the road to a familiar face, but remember not to turn too quickly – an over-balance or near-fall is not a good look! 7. Try and avoid tripping up or bumping into things – I need so much concentration to keep the walking going, that the slightest distraction (someone shouting, a car brakes screeching, a crowded pavement etc) can really affect how I walk. 8. Remember I have to walk home again – its all very well enjoying flowers and dogs in the park and walking further, but I need to be able to get home again! Starting out I often feel quite good physically, but after only a short distance pain and stiffness can slow things and I end up being overtaken by snails. How slow am I? well it used to take me 5mins to gallop from my front door to the railway station platform when I was a commuter. The same walk now takes me about 20mins (more if the road I have to cross is busy). 9. Remember to look pleasant! Parkinson’s makes our faces so much less mobile and one of my two firm resolutions has been to try my utmost to remain as smiley/pleasant-looking as possible. Its very difficult to do! There have been occasions when I think my face looks relaxed and smiley but I’ve been horribly shocked at catching sight of me looking not only gloomy but downright cross! I could tell you all about coping with fluctuating blood pressure, auditory dysfunction etc etc but I won’t!! This blog isn’t meant to be about evincing sympathy but rather to show how much effort many people with Parkinson’s put into staying #incontrol for something as simple as a stroll outdoors. We are doing everything we can to appear “normal” (whatever that is)!! I am off out and #incontrol ! 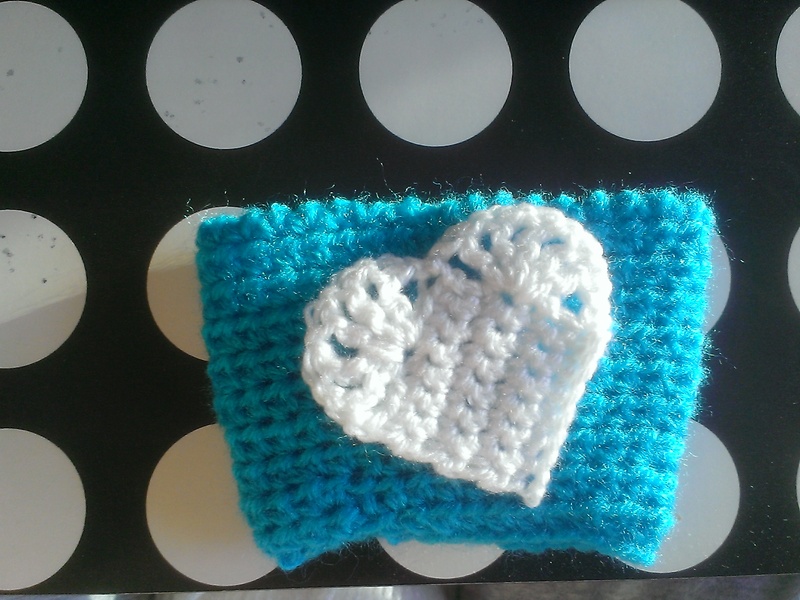 Some weeks ago I was inspired to try and crochet a coffee sleeve for a dog rescue organisation I am loosely associated with. Up to that point I didn’t know what a coffee sleeve was (it is in fact a “holder” for those super-hot take-out coffee cups) but my crochet skills were only up to the task of making the basic sleeve. Designing a shiba-inu motif for it was, however beyond me. 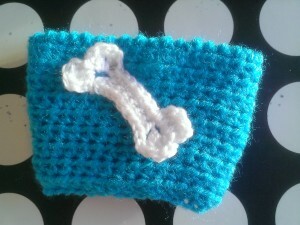 Here is photographic proof of my endeavours! All sorts of crochet appliques can be found by a search of the internet – I just had fun picking three designs! 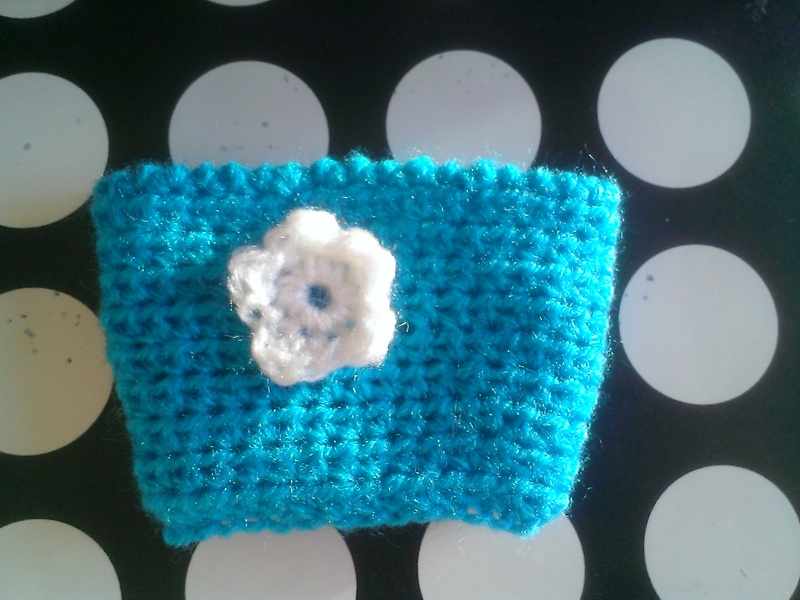 Sadly, despite my enthusiasm, I remain a rank amateur/beginner in knitting and crochet so I will leave it to you to find your own designs. HDC = half double crochet (UK) in the USA this is known as a half-treble crochet! 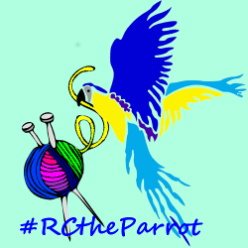 If you have any doubts about how to work the stitches, just search the internet – there are many excellent YouTube videos on all aspects of crochet and knitting! Join with sl st in first ch – take care not to twist chain. Work one row of reverse single crochet (aka crab stitch). Its Day 1 of the UK’s Parkinson’s Awareness week – the hashtag #incontrol is being Tweeted far and wide and it is truly heartwarming to read the stories and see the pics of all those battling life with parkinson’s or supporting those with the disease. The tag “in control” is a good one as living with early/mid-stage parkinson’s can often make you feel very out of control – a light-hearted analogy might be to imagine riding one of those subterranean, log-flume-y, about-to-get-wet/scared/surprised, kind of rides at a theme park or a ghost-train at a funfair where just when you think you have coped with one thing along comes something else to surprise you – the reality of course is that with parkinsonism you never get off the ride but familiarity with the surprises can lessen their shock value. These days, those of us living with parkinson’s disease/parkinsonism have the advantage over those who had the disease before the development of modern drugs. Neuros are often quoted as saying “if you have to have a brain disease, then parkinson’s is probably the best one to have” – not because there’s anything delightful about losing the ability to smile, walking weirdly, writing illegibly, choking while eating, mis-hearing, mis-speaking and all the other horrid ways parkinson’s changes how you are, but because there really is a world of support available to help us be #incontrol, there are drugs that can ease symptoms, and there are therapies to help delay the onset or worsening of the condition and, finally but far from least of all, is the fact that the world wide web can bring us all together from every corner of the globe. No one with parkinson’s should ever feel alone in their fight and, together, we can help one another be #incontrol. This week’s Parkinson’s Awareness tag #incontrol means for me, that with everyone’s help and with my firm resolution, I and not my parkinsonism will be in charge! My part of the bargain is to find out as much as possible about the disease and what may lie ahead for me, and then do my utmost, with the help of everyone and anyone who can help, to figure out ways to deny the disease its progress. 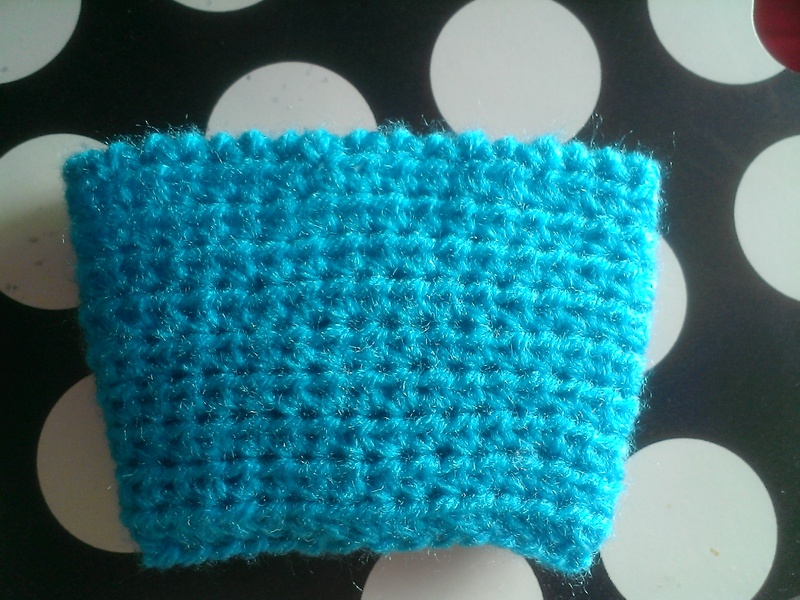 Parkinson’s is known to rob fine dexterity… so start doing something that requires such dexterity to build an alternative muscle-memory of it (knitting and knitting socks has been my answer, for many it is playing a musical instrument). Parkinson’s is probably going to wreck how you walk/move … so practise movements to help prevent this (LSVT BIG is amazing!) and make exercises and stretches part of day-to-day activities (yes you can sit on a Swiss balance ball while vacuuming, and it is possible to stand on tiptoe while waiting for a kettle to boil!). Tiredness can be overwhelming and very little effort can wipe you out completely … so pick the optimal time to do something so that you relish its outcome! Tremor can and will fling food off your fork .. that’s OK at home, but otherwise choose mashed potato as a side dish, don’t hesitate to use a spoon if its easier, or maybe just choose sushi or finger food instead! If you are out and about and think you need help to do something and there’s someone around to ask… ask them for help. Most people actually like knowing what it is they can do to help but often won’t offer for fear of offending. Just do it….. get #incontrol! I thought Parkinson’s was all about tremor – look at Michael J Fox, he is moving all the time, so why don’t you look like that? Tremor in parkinson’s disease (PD) is what most people think of when the disease is first mentioned, but not everyone with parkinsonism will have tremor. When present, visible shaking can range from small movements up to fairly large ones but all at a regular six cycles a second. Tremor is the manifestation of a misfiring of the signals from the brain to one’s muscles – and someone with parkinson’s tremor has no control over what is happening. Not everyone with parkinson’s experiences visible tremor however (I talk about internal/invisible tremor here) but when we do, it is instantly recognisable because of its regular rhythm. In the early stages, when other symptoms are less obvious, tremor is the one thing most of us try to disguise as much as possible. For some reason a tremoring person appears to be perceived as truly less able in all respects (perhaps because we conventionally associate such shaking with injury or extreme fatigue or infirmity), even though the person shaking with parkinson’s tremor might not be that old. Because parkinson’s tremor tends to be one-sided, certainly in the early days, it is actually fairly easy to disguise by putting a hand in a jacket pocket, clasping both hands together or, when sitting down trapping the hand under a leg. Sometimes, though, the effort of disguise is a stress in itself which can make shaking worse! Like most symptoms of parkinson’s, tremor is worsened by stress and as many people with parkinson’s have an overly sensitive “stress-o-meter” which can worsen or bring out visible tremor in the least stressful of situations for someone without the disease, tremor can be ever-present in public. The person with parkinson’s may not feel actively stressed, but the body has somehow perceived a stressor to which it is reacting. Known triggers for me range from crowds of people, noisy environments, and negative encounters through unexpected/unplanned events that BP (before parkinsonism) I’d have probably responded positively to, right down to something as basic as a home or mobile phone ringing. So, while I don’t have very visible tremor a lot of the time, it is always waiting in the wings ready to perform if I encounter a situation my system deems “stressy”. The name given to twisting and writhing is dyskinesia. As I understand it, dyskinesia is not a symptom of parkinson’s itself , but rather a side effect that can develop when folks have been on parkinson’s dopamine replacement drugs for a long time, or, too much dopamine has been taken regularly. As Michael J Fox himself said, in the early days of his diagnosis he would have a pocketful of levodopa tablets and just pop one if he felt his finger begin to twitch – it can be very tempting to do this as the effect of medication in the early stages is relatively quick. Parkinson’s specialists are expert at determining how best to modify drug treatments to obtain best results and these days there are a wide range of drug options. If dyskinesia is developing, it is important to see your neuro to discuss what can be done as there is a fine balance to be struck between optimal benefit and side effects. As many of you already know, my parkinsonism was triggered/accelerated by anaesthesia in 2006 and at that time progressed so rapidly that I was started on parkinson’s medication within four months of first symptoms appearing. From the early days, my neurologist explained the toxic effect of the drugs but said that we could adopt a “less is more” approach and I believe this has been why I have done so well – the neuro sets maximum daily doses for the different drugs and leaves it to me to tailor what I take and when I take it. Prior to parkinsonism I was lucky in never having to take regular medications, so my preference is to only take what I need and…. so far… no dyskinesias!! I watched my Mother struggle with Parkinson’s, and personality changes due to the disease and/or medication. Focusing on one topic for any length of time was not easy for her, at times it was painful to me watching her trying so hard to keep up with the discussion. If I’m in a position like this with someone else struggling with Parkinson’s, is it better to continue with the topic, or ask if there’s something they’d rather talk about? I want to show respect for however they want to fight their disease demon, but I also want to afford them the opportunity to be part of something as long as they want. Any thoughts?? That is a really insightful question and I suppose the answer depends a bit on how well you know the person and how much they have included you in how/where they are with things and, of course, at what stage of the disease they are. Most of the time those of us with parkinsonism just want to be “normal” (whatever that is).. we don’t want a fuss made, we don’t want every situation to become about us, but I believe we also have a duty to accept the offers of those who genuinely wish to be helpful. It is very hard accepting that you need help… really difficult, especially if you have always been independent in nature … but my rule is if someone has asked me if I need assistance, it is probably because it looks to them as if I need it! I then almost always accept. Maybe another time, you can speak to the person ahead of an event and just tell them to give you a sign if they need help or its all getting too much, then leave them to their devices… it is a very difficult balancing act. It is doubly difficult when it is a loved one, I am sure, and even a parent/child “dynamic” can bust in too … That’s really food for thought! Good question. It is 18 months since my application for ESA was approved and I was placed into the Support Group. Since that time I have been receiving ESA on time and have felt calm and reassured that the process was complete and that the DWP/ATOS had accepted my eligibility for the benefit on the basis of the evidence submitted by me and my doctors. I thought that all was in order. Parkinson’s is a chronic, progressive and currently incurable disase. Chronic, because it is long-lasting. Progressive, because the disease process/symptoms worsen over time. Currently incurable, because despite advances in drugs or treatment (not all suitable for everyone with the disease, by the way), there is no cure, there is simply the potential to ameliorate some of the symptoms. Parkinson’s has a huge raft of symptoms, not everybody experiences all of them, but just Google and be shocked at the wideranging and individuality-killing nature of this disease. Parkinson’s is not (just) about tremor and publicly visible symptoms, but appears to set out to eradicate everything that made the individual who they were, how they appeared and what they were able to do. Once diagnosed and on the slippery slope of this disease, there is a constant battle, with the help of therapists and doctors, to maintain oneself as best as one can. Just look at all the pamphlets produced by Parkinson’s UK (linked here) and you’ll get an idea of just how all-intrusive this condition is. Thus, coping with parkinson’s, like any other chronic, progressive and incurable neurological disease, is tough, but its a battle that those of us with it fight as best we can. In my case, currently, some symptoms are worsening, some seem to have plateaued for a while but a few new ones are making their presence known and requiring new medical management. Someone living with such a disease in the UK is fortunate to have available a range of health and medical professionals, charities and support workers, to inform, encourage and help them cope with the disease process. As individuals with the disease, we have to try and be as positive and self-motivating as we can to deny the disease its hold over us. People with Parkinson’s, in particular, need a life that is calm, supportive, up-beat, positive and non-traumatic – it is in maintaining a positive equilibrium that they have every chance of being the best they can be in the circumstances. It doesn’t take much to disturb that equilibrium which results in an instant overload of coping mechanisms – beyond the control of the person with the disease and extremely shocking to them. Stress, trauma, confrontation, hostility, noise and negative experiences all worsen the symptoms of those with parkinson’s. People with parkinsonism, therefore do not need an unreasonable and inappropriate application and reassessment process for ESA, one of the key benefits available to them but, sadly, that is what happens at the moment because the French computer company, ATOS, is, in my view, signally failing to manage the DWP’s ESA benefits process in the fair manner expected of them by the public and Parliament. (NOTE: read earlier blog entries for background, starting here). Once ESA has been granted to someone with a chronic, progressive and currently incurable disease and they have been put into the Support Group, that person is not going to stop needing to receive it…if anything, they are probably going to need more fiscal support and additional benefits. As far as State benefits are concerned, it is of course appropriate and reasonable that individual casefiles should be reviewed periodically, medical professionals should be invited to submit independent reports and, perhaps the individual themselves or their representative can be invited to review and confirm statements made in the past and that they remain valid and be given an opportunity to update the information held. A modification of the original application form for this purpose would be very straightforward. That’s not what happens and this is how I know. 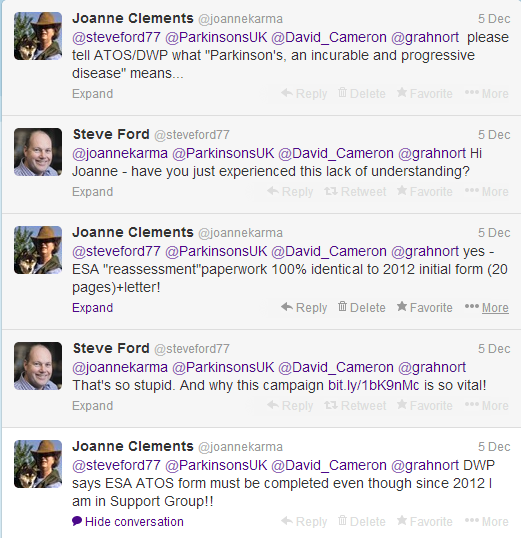 On 5 December 2013 a fat brown envelope from ATOS (on behalf of the DWP) arrived in the post. Opening it and reading its contents instantly overstressed my system, sending me into windmilling tremor and tears. It was an 18-page form and its covering letter told me, as if for the first time, that my Incapacity Benefit was to be converted to ESA and that the form had to be completed for a full assessment of my eligibility for ESA – failure to complete the form will result in a suspension of benefits. I couldn’t believe what I was reading – it was a duplicate of the paperwork received in 2012!! You’ve all heard and maybe seen the movie “Back to the Future” well… this felt like a weird form of time travel… and not in a good way. All the stress of 2012 (NOTE: read my blogposts of that time) just flooded back. It felt as if the system had never granted me ESA and my being put in the Support Group had never happened. In one split second I am reduced to a physical and mental wreck and I can’t control the torrent of stress that tries to overwhelm me. 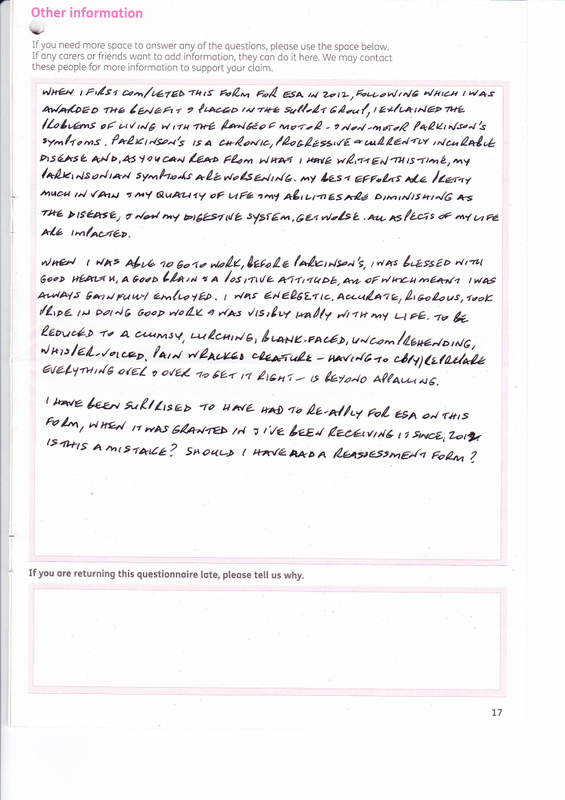 In case I am mistaken, I open my file of DWP paperwork and extract the letter and form I received in 2012 – fumbling and dropping the folder and pinching my fingers in the lever-arch clips as I do so – annd compare the new letter and form with those I received in 2012. The letter, apart from its date, is word-for-word identical and with a few minor changes the form is also the same. I am immediately shocked and assume that somehow mmy original paperwork has gone missing – my system explodes with stress and tremor. I can’t think straight. Then… I think that perhaps the paperwork has been sent by mistake and I should have received a reassessment form instead. My mind is whirling at the threat of benefits being stopped and I wonder how I am to cope. Once I have got my windmilling a little under control, enough to hold a telephone receiver, I call JobCentre Plus in Stratford. Still in mega stress (voice trembling, thoughts scrambling, hand tremoring) I explain the situation and am baldly told that I have to complete the form to apply for the benefit. I suspect I haven’t explained things clearly, given my stressed state, so I try again and say that I am already in receipt of ESA and was placed in the Support Group in 2012 so has there been a mistake in sending me an original application form again. 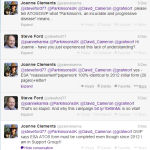 I am then told, in a very matter of fact manner, that ATOS does not have a reassessment process, there is only one form of application for ESA assessment – the original one. The woman I am speaking with says that I will have to complete the initial application form all over again because, of course, failure to do so by the deadline of 3 January will result in suspension of benefits. 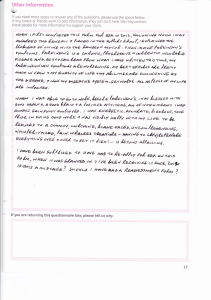 I am appalled – not only at the thought of having to try and complete such a big form as writing is now very difficult due to cramps and jerking – and ask why, if DWP/ATOS can’t create a reassessment form, doesn’t the cover letter at least make some reference to this being a reassessment. As it stands the paperwork is misleading and gives no indication that ATOS/DWP is aware that ESA has already been awarded. I am also a bit bewildered as it is as if the entire ESA assessment process is just beginning again, with all the worry and stress that involved (see previous posts). A note of regret does seem to enter the voice of the person I am speaking with at this point, as she says that every day she and her colleagues are having to have similar conversations with many people with a wide range of progressive/incurable conditions but there is nothing any of them at DWP can do because it is ATOS that is tasked with administering the process. I thank her for her time, replace the receiver and feel completely shell-shocked – what purpose can be served by just resetting the process in this way? Is ATOS simply making work for itself? I wonder what the process for a similar benefit would have been like in the past, when government administration was in public rather than private hands…not sure how to find this out. It is at least of some consolation that the Chairman of Parkinson’s UK agrees with me! Time passes and the form is posted on 20 December, by Recorded Delivery, well in time for the stated deadline of 3 January 2014. Completing the form took me more than a week – it is done in capital letters as I can’t write properly any more and I had to keep stopping as hand cramps kick in. It was tough. Tough not just because of the process of form-completion but because I had to revisit every aspect of my disability – seeing it written down was very fed-up making. At every turn, after diagnosis, one is encouraged to try and come to terms with the changes brought about by symptoms. To accept, as best as one can, the inexorable erosion of ability in all things. To battle, with the help of medics, drugs and therapies, the worsening of symptoms. One is encouraged to look for what continues to be possible rather than to focus on what has become impossible. Having to reiterate the worst of one’s condition is like a little death – as the you that was is smothered by disease – and it makes one confront the reality that that things can’t ever be the same again. As one’s abilities deteriorate, actually completing the paperwork will become difficult, if not impossible… so what happens then? Is this what a disability benefits process is meant to be? I am sure it wasn’t what the DWP intended when it appointed this private computer company to the task. Its certainly not what I expected of it. Politicians on all sides forever speak of trying to create a fair society so surely, in a bid to create some kind of fair society for those whose diagnosed conditions are currently incapable of being reversed or cured and whose lives are already difficult enough, someone could devise a more practical ESA reassessment process? The current one is unwieldy and wastes a huge amount of effort, not just on the part of the disabled, but doctors and others called upon to contribute and, ultimately, on the part of those having to process unnecessary paperwork!). It is very wrong, arguably bordering on cruel, to threaten such vulnerable people who are already in receipt of ESA with its cessation. There are many, like me, whose condition is directly worsened by the stress of this threat. There is something seriously wrong with a system that is trying to make everyone fit into a single “shape” simply because the computer company running the process, and being paid £80,000,000 (eighty million) a year for doing so, can’t be bothered to do the job properly. There has got to be a sensible way that the DWP and medical professionals can agree, once and for all, a straightforward and practical way of reassessing those individuals who have previously demonstrated beyond doubt their genuine entitlement to ESA/disability benefits and eligibility for the Support Group. Each progressive/incurable condition has its own path to death, and each individual walks that path at a different pace, all the time trying to find ways to avoid the inevitable conclusion. In a civilised society there has to be a way of recognising that once on such a path of no return, the individual needs to be nurtured and supported by the entire system, including the benefits system – not threatened or browbeaten by it. I have yet to receive any feedback or further information. NOTE: the ESA award was continued until I was required to take early (medical) retirement in August 2014, at which point because I also got a small lump sum from my penson pot, my savings now exceed the minimum threshold for benefits. My monthly income is less than ever but I have to survive now until State Pension kicks in (if it still exists) when i am eligible for it! !